Keg cleaning and filling are keys to quality beer — do you have the right strategy? Craft brewing pioneers had a problem. They had a ton of passion for brewing and fortitude to see their vision come to life, but they were basically jump starting a long dormant industry. Beer wasn’t new, but the size of the companies brewing was. The lack of a real marketplace meant a lack of equipment and resources scaled to meet their needs. Flash to 2014, and the brewery total in the United States is approaching the highs from a previous century. As a result, during the past few decades, equipment vendors reconfigured their own businesses to meet the needs of this real, underserved, fledgling industry. Long story short, craft brewers have options now — legit options— for every function, and on a scale that works for them. One of those major choices involves the mighty Sankey keg. IDD Process and Packaging’s Squire “Plus 2” with Fill by Weight. Learn more about the importance of fill by weight later in the feature. For example, one of the first specifically built Sankey keg washing, sterilizing and filling systems for craft brewers was developed in the early ‘80s by Jeff Gunn, president and CEO of IDD Process & Packaging Inc., then with APV, for the late Bert Grant of Yakima Brewing Co. Then came the introduction of chemically sanitizing kegs in ‘90s, also ushered in by Gunn. The reason for this was, for the most part, craft brewers don’t have the 40 PSIG of steam required for a proper steam purging and keg sterilization. And that’s the point. There is no excuse today for less than optimal solutions, especially when it comes to washing, sterilizing and filling kegs. Today, 90 percent of the craft brewing industry uses small, semi-automatic systems that accomplish everything necessary to properly clean, sterilize and fill a keg. If you haven’t thought much about your keg filling in awhile, now might be the time to reevaluate and upgrade. ●What is the speed of the keg machine needed? ●Do you want both caustic and acid cleaning or only one of those? ●What is your number of tanks (caustic, acid, hot water, mixed water)? ●Do you have a keg turner or keg turner/lowerer (yes or no — which one)? ●What is the length of your conveyors on the infeed and discharge side? ●What is the shape of your keg plant (U shape, L Shape or in-line)? ●What is the size and type of kegs to be processed? ●Can you provide a drawing of the room or available space for the machine? ●What are the electrical specifications of the brewery? ●What is the expected delivery of the keg plant? ●What is the performance of the keg machine? ●What is the price and lead time? ●Is there a warranty, and what are the details? ●What is the availability of spare parts? specifications required by the manufacturer for optimal performance. operate, maintain and eventually repair the equipment. commissioning of the keg machine/line. The Mini King “Plus 2” with Descending Turner from IDD Process and Packaging. There are systems on the market now, such as IDD’s Squire series machines (pictured earlier), equipped with infrared, fiber-optic, pressure transducers and RTDs that monitor these processes and also control them. If a process is sensed to be out of step, the keg is then rejected and the process is stopped. Understand what your keg is all about, how it works and how the system processing it monitors and controls the washing, sterilizing and filling process. Wash flow rates for a Sankey keg are critical in order to ensure that all inner surfaces are washed, including the outside of the spear tube in a keg. Do not make assumptions that processes are occurring correctly, it can be very expensive when something other than good quality beer ends up in the keg in a bar being served to your customer. “Many craft brewers, will spend the very least amount of money possible to wash and fill a keg with beer after they have spent hundreds of thousands on equipment brewing the beer,” Gunn said. When it comes to cleaning for small machines, Corticchiato recommended caustic, acid and steam or acid with caustic additive and steam. For larger, faster machines and keg lines, which is Comac’s speciality, he recommended caustic, acid and steam or caustic 1, caustic 2, acid and steam. With some Comac machines, the duration of the caustic solution holding stage (between pre-washing and washing) and the sterilization period (between washing and filling) can both be customized according to the length of the conveyor connecting the two machines. Gunn noted that you do not want to overdo it with caustic alone. The continual use of caustic can result in the precipitation of solids that cling onto beer proteins resulting in beer stone. Be sure to mix up use of caustic and acid washing, along with a sanitizing or steam sterilizing sequence. This uses half the chemicals while producing a clean, sterile keg. Look for keg systems, such as those offered by IDD, that come equipped with these alternating sequences. Another reason to upgrade your keg filling system is to reduce your keg-filling losses dramatically. Why waste good beer in high demand? Filling losses can vary dramatically depending on the manufacturer of the keg machine and the procedures that brewers may or may not follow with their manual keg machines, but Corticchiato said Comac keg-filling machines only lose between 50 and 70 ml because of advanced flow meter controls. “I have heard some horrendous numbers from some breweries with very manual, old keg machines, when they don’t apply strict filling control,” he said. “Other examples of options increasingly chosen by craft brewers include a mixed water tank to save water, remote assistance connection that allows our technicians to look into the keg machine/line PLC remotely and extended cylinders to automatically close the filling heads during CIP operation,” Corticchiato said. Some keg fillers on the market, like the Comac HS6T, can optimize cycle times thanks to a fast loading system and a working cycle that doesn’t require the keg to be moved from one head to another inside the machine. A limited number of valve opening strokes can reduce wear and tear of the sliding guide and head components and, therefore, can reduce downtimes, maintenance times and costs. IDD’s craft brewer keg systems offer “fill by weight” or “meter” filling as options. Gunn said that all Sankey kegs should be designed with one percent oversized when new. Believe it or not, kegs expand over time, so metering could end up saving beer. Gunn said the ROI on a metering or fill by weight system is typically 3 to 8 months based upon product and volume kegged. For Corticchiato, the major advance for large keg lines has been the creation of the train system. For Comac this is the HS6T. Not all craft brewers are at this level of production, but the HS6T is a train system that has a 250-kegs-per-hour minimum speed. “Comac offers flexible customer service. By flexible, I mean quickly and accurately responsive to the various needs of the customers and not rigidly locked into a predefined system that leaves us unable to answer unusual challenges,” he said. 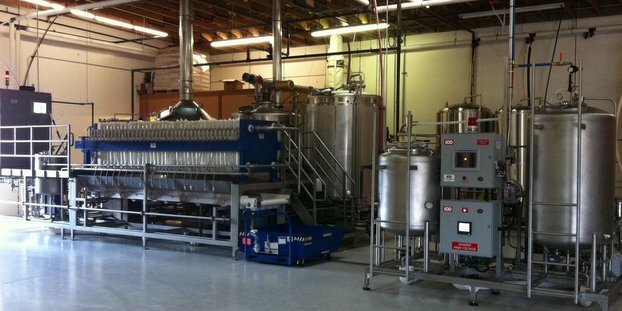 Is flash pasteurization right for your craft beer? Hantus Mostert liked this on Facebook.